Welcome to Caravans West, in Melbourne. For New and Used Caravans and Camper Trailers and Pop Tops for sale in Melbourne, Geelong, Country Victoria and Tasmania, the Home of Kingston-Bell Caravans. 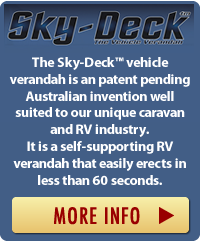 We are proud to be the stockists of the SKY-DECK™, patented vehicle verandah system. Come and inspect the new dimension in caravans for the next generation of caravan owners. In a World first, the SKY-DECK™ feature was launched by Caravans West at the 2012 Caulfield Caravan Show, on display at our Sales Yard in Springvale. Kingston-Bell Caravans are Built to exacting standards by MCR, on our site, Models include the Pixie, the Protea each with Sky-Deck options fitted. The Kingston-Bell High Country, is an extreme Off Road product, featuring the latest in Solar and Diesel powered appliances. Pacific Caravans are our most recent inclusion in the line of Exclulsive Brands now available at our Springvale Sales Facility, built here in Melbourne these stylish and affordable Caravans offer even more for the budget conscious buyer to consider. The New Pacific Range of Caravans, come with ensuites to all models. Prices Start from $58,990 drive away, for the 17' Single Axle Models featuring a full ensuite. Pacific Caravans are for the discerning buyer offering a range of choices from Traditional Timber Styling to the Ultra Modern Styling so popular with todays buyers. From 17 ' Models to the Glorious 23' Models, there is something for everyone, at a competitive price. Kingston-Bell have launched, another first, with the release of the "High Counrty" , Off Road Pop Top, a truly amazing caravan, that is totally gasless, running all on board systems from cooking to heating solely on the latest diesel technoogy, backed by a "state of the art" Solar System to accommodate the compressor refridgeration system featured on board. Well worth a close look before spending more on major brands offering far less value. Buyers, Please Note ...The Series 11, Kingston-Bell High Country Model will be released at the upcoming 2015 Melbourne Caravan Show in February. With more new models and brands to be announced soon, our future has never looked brighter. With over 100 new and used Caravans and Camper Trailers for sale and on constant display at our new and ever improving indoor/outdoor site at Springvale, Melbourne, you'll be able to view all the models at your leisure. With a fantastic range of camper trailers,pop tops and caravans, from Kingston-Bell and Pacific, along with Sky-Deck™ Equipped Models for sale in Melbourne you can see and compare new or used caravans and camper vans that are available. Come and visit, Monday to Saturday (Sunday by Appointment) ask us as many questions as you like, or tour our site on your own; we're all here to help. We commenced business in October 1999 as an independent Used Caravan Dealership, specialising in Repairs, Servicing and Spare Parts and Accessories, in Melbournes Western Suburbs. EXCLUSIVE RELEASE OF THE " HIGH COUNTRY" OFF ROAD POP TOP. APPOINTED EXCLUSIVE VICTORIAN DEALER FOR MONTANA CARAVANS. Caravans West is able to assist you with all things related to Caravanning and the Caravan Lifestyle. Alan started in the industry in 1973 in Gosford NSW, servicing and repairing caravans around the district. In 1989 Alan relocated his family to Coffs Harbour NSW, and commenced a new Caravan Repair business. ABCO Caravan Services was established, steadily growing over the next 7 years to become the largest repair centre in country NSW. In 1996 Alan sold the business to the present owners, who carry it on to this day. Alan took up a position with Regent Caravans in Victoria as Service and Warranty Manager, and later as Production Manager of the Monarch Crusader Range of caravans and pop tops, after 3 years it was time to move on. In December of 1999, Alan established CARAVANS WEST in Sunshine North as an independent Dealer/Repair Facility, the rest is history, growing in size and turnover to become COROMAL's 2nd largest distributor in Australia by 2008, and the largest Distributor in the Eastern states of Australia. August 24th 2009 saw another milestone for Caravans West, with the establishment of a New and Larger Coromal Dealership in Melbourne's Eastern Suburbs at Springvale. Caravans West Springvale, opened its doors to the public, at its new site, promising to offer a higher level of service in a central location with handy access to all freeways and highways, at 845 Princes Highway, Springvale, 3171. Phone no. 03 9574 6077. Caravans West continues the 17 year long tradition and from this new Facility are now better able to service their customers from all parts of Melbourne. Skydeck and High Country Models. and the Finest of Used Caravans anywhere. December 2011, Kingston-Bell Caravan Range was launched... (built by MCR EXCLUSIVELY for CARAVANS WEST). Another milestone for Caravans West. Now able to offer a range of caravans that can be tailored to your individual requirements. Shorter delivery times and a good old fashioned quality you would expect in your next caravan. Thursday 8th March 2012, the first day of the Melbourne Caravan Show at Caulfield, history was made when the long awaited and patented caravan design known as "SKY-DECK™", was unveiled to the public, by Caravans West and Melbourne Caravan Repairs (MCR). Public and Trade reaction to this breakthrough design in caravan space use, was overwhelming, hailed by all lucky enough to catch a first glimpse, as the best thing to happen to the caravan industry in Australia in decades. On display at our Springvale Yard, the buying public are invited to inspect the new dimension in Caravans. Orders are now open. 2013 marked the addition of Pacific Caravans to our brands on offer. All These Stunning new caravans will be on display at the upcoming Melbourne Caravan Shows in 2015, and at our sales yard. 2015 ( June) ...We are pleased to announce that Caravans West has been appointed the Exclusive Victorian Dealership for Swift Caravans and Motor Homes . The first of these Specially prepared Australian Models in the Explorer Range are now on display at the Springvale Display Yard. These Lightweight European Caravans from Britain's largest Caravan manufacturer, will allow owners of lighter SUV's and European and Japanese car owners to experience the lifestyle opportunities caravanning has to offer in Australia. 2015 ( December )...Caravans West Appointed Melbourne Dealers for Traveller Caravans, established in 1984 Traveller have carved out a remarkable reputation for Quality that stands the test of time, with innovation and design placing Traveller Caravans as leaders in the caravan industry in Australia. January 2016...Caravans West was granted its LMCT Licence Approval. This LMCT approval is the Key to Caravans West moving into the marketing of the new 2016 Range of Swift Motorhomes. The first Motorhomes are now filtering in to the Sales Yard, please come and Inspect the range, we know you will be as impressed as we are. April 2017, Caravans West appointed Exclusive Victorian Dealers for Montana Caravan Range, these Quality Built and yet Affordable Caravans are competetively priced, and offer Single Axle and Tandem Axle Models in On and Off Road vatiants. In 2018 the range has been extended to include Family caravans as well. Offering a full range of services from this new location, our new and expanded Spare Parts and Accessories Store is open for business and managed by Janette De Losa. We look forward to meeting many new and existing customers at this very convenient and easy to find location.